Glen and Stephen Thistlewood, in their book, A Century of Carnival Glass, point out that the pattern is found in a US Glass 1919 Export catalog and also an Iittala (a Finnish company) 1922 catalog. Consequently, the Thistlewood's suggest it is likely that US Glass sold the molds to Iittala. 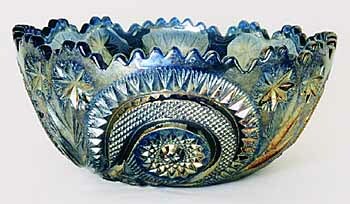 This blue 8-inch bowl sold in 1998 for $95. A very similar pattern is made by Smith Glass, so be careful when buying.